What do women really want? This is a question that has surely vexed government policy-makers since they first decided to replace Labor’s existing maternity leave scheme (18 weeks’ minimum wage payment) with a more lavish Coalition version (26 weeks’ worth of salary replacement up to $150,000 per annum – later capped at $100,000 – plus super). It is surely vexing them even at this moment. as they scramble to trade the now-defunct scheme for a vaguely-defined ‘families package’. It’s a question that preoccupies me, too. As my children have become self-sufficient – my oldest child embarked on her own post-university career just last week – I’ve reflected increasingly on the choices I made as a young, professional mother, my idealism at the time, and the advice I would give my own daughters should they choose to combine children and career. I’m the product of the same imperfect system we’re still saddled with today, where a working woman who chooses motherhood sets off unwittingly down a path that will drastically alter not just her body and psyche but her career as well. Unconsciously – for how can the expectant mother possibly intuit the upheaval that awaits her? – working mothers commit to an interminable, relentless, colossus of a workload, and to adapting and moulding their own lives to accommodate it. The rewards of parenthood are immeasurable. But the price that women pay when they become mothers is unjust: lost opportunities for those who’ve taken a break to care for their children; promotional opportunities withheld by employees who believe childcare responsibilities preclude mothers from working high level jobs; wages that don’t keep pace with inflation; gender wage gaps; sparse savings. The consequences are dire, placing Australian women at a higher risk of post-retirement poverty than men. According to a report released by the Association of Superannuation Funds of Australia last year, women retire with about half as much superannuation men, and one in three has no superannuation at all. Short of building nurseries alongside their offices, equipping them with full-time nannies and returning to work weeks after the birth, as did Yahoo’s CEO Marissa Mayer, women have very little hope of getting through motherhood with their careers unscathed. For this reason, an efficient and fair maternity leave scheme is fundamental to supporting them as they transition from worker to working mother. But while such policy forms the backbone of a progressive society in which mothers’ contribution to the workforce is valued, the dearth of quality, affordable childcare still prevents many of them from returning to work. While women’s organisations have long demanded an expansion of affordable childcare services in Australia – an issue it’s hoped Tony’ Abbott’s ‘families package’ will tackle – few have addressed the behemoth of an elephant in the room: the fact that the people working long and irregular hours at low pay to provide affordable childcare will be the very group we’re trying to protect from exploitation in the first place, women. That child rearing remains an exclusively female responsibility – that the slack must be taken up by someone, and that someone will almost certainly be yet another woman – seemed to be lost even on Marie Coleman, chair of the National Foundation for Australian Women Social Policy Committee, when discussing the link between affordable childcare and increased workplace participation by women on Radio National’s Breakfast earlier this week. ‘If we can get our minds around how to make childcare services more affordable and flexible for the women who work shifts, we’d be doing a lot of very hard-working women a great favour,” she said. And what of the women who must step into the breach by caring for these hard-working women’s children? What of the women who are trying not to progress their careers but to merely earn a living wage? And what of the mothers who decide to forsake paid work and take on the childcare role themselves, thus saving the government money, freeing up spaces in childcare facilities and relinquishing both their income and their claim to maternity leave payments? It’s a conundrum that will never be easily resolved. Men and women want children; children must be cared for; a flourishing economy depends on women in the workforce; employers want workers who aren’t distracted by other responsibilities, such as children; but still, children must be cared for. The problem will stay with us until we can agree that children are not exclusively the products or the preserve of women; that they are an asset to society, and that each one of us bears responsibility for them. Thinking back to the 14 years I spent out of the workforce raising my children I can say this: it was a time, for me, when the importance of working outside the home faded and a time also of budgeting where every dollar was important. That is a personal perspective. When I look at my two daughters juggling raising children with keeping careers going either part-time or using maternity leave I can see that mortgages are larger and so are expectations of satisfaction from careers. I think each one of us does bear responsibility for children in our society - they are our most precious asset and governments need to take seriously the tremendous burden placed on women especially. I agree with Catherine Marshall that there are many issues facing families raising young children. My wife and I were lucky enough to be able to have one of us home for both our children. Things were tight with only one income, but we got by. However, I disagree entirely with her that it is the government's responsibility to do something. As a country we seem to think that the government somehow knows all of these complexities better than we do ourselves. We think that the pollies and bureaucrats in Canberra will devise a workable solution. I wish that the government would stick its nose out of my life. We are already regulated beyond belief, with legions of public servants drawing a salary but not producing anything for the wider economy. Families should work out for themselves how to balance life and work. They should not expect their choices to be funded by the government taking money from other people and giving it to them. I do not see why I should bear responsibility for someone else's children. Welfare should be for those in true distress, not for women wanting subsidised child care. My daughter was a fully qualified childcare worker, loved babies and children, was very, very good at her job .... and gave it up after a few short years. She joined the public service and her "training wage" was more than she got paid when she was in charge of a childcare centre. Basically, career women were ripping her off. Bottom line, "cheap childcare" says what value you place on your children and their carers and it's not flattering. As far as I'm concerned, paying for childcare is paying for a place on the career ladder rather than stepping off it as most women in my age group had to. When children are below school age, it's not a time to be making money for their parents (read 'mother' in most instances). It's paying to keep your job and keep abreast in your field so you can earn money in the future. For those truly reliant on a second income, there should be separate provision based on need rather than simply subsidising childcare for all. This is a difficult issue. Our children, in our case grandchildren, are the mature citizens of tomorrow. We want them to be open minded people of justice. Each family needs to take responsibility for their own children in the way that they can afford. Sacrifices need to be made by both parents. It doesn't hurt children to hear the words, "No, we can,t afford that." Cheaper childcare means more, mainly women, on very low, unjust wages. When we married more than 50 years ago, my wife and I decided mutually that she should give up her career and plan for motherhood at home. We had two reasons for this decision. My salary was sufficient to support my family; the ideal concept of father working, mother at home raising children appeared to us to be in line with Catholic teaching on the family. Within a decade both beliefs vanished. My salary became insufficient as living costs rose when two income families became the norm. And Catholic teaching no longer seemed to demand that we ‘breed like rabbits’. My wife resumed her career and began the onerous task of working mother that Catherine outlines so eloquently. Let us as a society give all the help needed to our wives and daughters who choose, often unwillingly to combine work and family life. Some great points in this article. One option that should be considered is the model of income splitting that has been introduced in Canada. It reduces the tax burden and enables some women to have the choice of whether to stay at home or go back to work. Most women don't have that choice now and that is where the cost to society becomes huge. We need to be looking for solutions outside the box to improve in this area, as what is currently in place does not seem to benefit anyone. "..child rearing remains an exclusively female responsibility..." This inane statement immediately renders this entire article irrelevant and self-centred and betrays a complete lack of understanding of what parenthood means. If women don't wish to involve themselves in parenthood, don't have a child. If you have a child who plays second fiddle to personal desires don't ask the working taxpayer to pay for the child's upbringing. Tony Abbott, using taxpayers money owes bugger all to working mothers. It is working mothers who are incurring great debt if they favour career over a child who depends on them. Flawed feminism! Every family I reckon will have a different take on the pros and cons of subsidised childcare. Catherine tells her story in a way that many professional women in their 40s and 50s could identify with. My family of origin had one wage earner - my father, a carpenter by trade. He only ever had one suit, never owned a car or a house but had one goal - that his ten children should be educated in catholic schools up to matriculation - university entry level. After that we were on our own. My mother laughed outright when he boasted to guests at our regular Sunday roast: "No wife of mine will ever go out to work." Fortunately we kids all saw right away why Mum was laughing. So did Dad, when one of the guests asked: "Who would do all the work your wife does, if she did go out to work?" 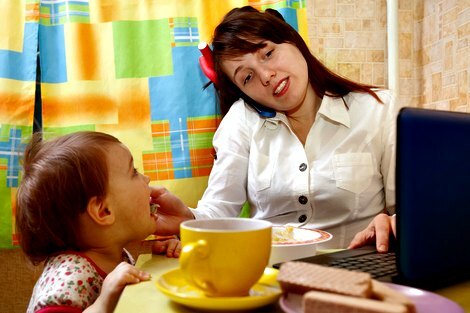 What to do about the wife and mother who has to go out to work is a complex socio-economic conundrum. A lot more complex than the wife and mother who doesn't need to go out to work. Men want children too, so policies need to address the needs of all parties. The family approach. Let's not entrench sexism with a narrow discussion about one gender: rather, consider how the family unit can be encouraged to achieve balance. Having been widowed and brought up 2 tiny children on my own, I have many stories and thoughts on the way women and children are treated. My daughter’s saddest encounter was at a Father and Daughter dinner when one of the fathers asked her: “What could possibly be more important to your father than being here?” She replied: “He’s dead”. The poor man was so shocked, he’ll hopefully be a little more thoughtful before he makes judgements in future. Just another day to pick up the pieces. Btw, I’ve worked very hard and had no handouts from the public purse, though I am getting tired of the struggle and especially tired of the free loader victim mentality so prevalent. I’m proud of being independent and supporting my family all these years, not easy and I don’t recommend being a single parent. From my soap box of experience I say stop complaining, you’ve chosen children, for them, put love, welfare, needs ahead of everything. The sacrifice is worth it. I don't understand why women have children and want another woman or women to care for that child. I wonder what is meant by 'motherhood.'' Could it not be the most rewarding of all careers?Does not having a baby bring with it some responsibility? Government help with child care, may be less of a burden on the economy , if it was only given to those in real need. Or alternatively some of the savings could help those mums who make a remarkable career of caring for their own children, in their own home, thus `nurturing , in one way, perhaps, the most important structure in our society, '' the family.''! !i do find it abhorrent that some women choose a career, when money is not an issue,and leave their beautiful small children in the care of virtual strangers.Their child care payments may be better spent on hospitals etc. My attention has been drawn to the comments about my recent (brief) RN interview in the above article. Wdere Ms Marchall to have spent any effort familiarising herself with the work of NFAW, and myself, on this topic, including submissions to the Productivity Commission, she would have known that we are strong supporters of equitable employment conditions for child care workers. Were she familiar with short radio interviews she would be aware that the format gives limited scope for straying beyond the questions asked by the interviewer. I am also torn as to what to advise my daughters, who are young professionals. To be honest I regret staying home for 14 years to raise my three children. However, I did have a disabled child and that made it nearly impossible to get good care for him. I missed my career and the mental stimulation terribly. I lost my independence, confidence and my super etc. Getting back into the workforce was also difficult and I still couldn't work full time because of demands with my disabled child. I do tell my girls to stay with their career if possible. Hopefully they can afford a shared Nanny or something. I also really hate the thought of a young baby or toddler going to long day care. It is a very difficult decision and men still aren't expected to give up their career as women are. Also to Father John George, why are you only speaking of mothers responsibilities where the care of children are concerned? It's time Fathers shared the load equally.